Going through my hard drives last night I seem to have misplaced a folder of "Dean Wareham" recordings (including the phone message Dean left me from Brussels in 1997!) 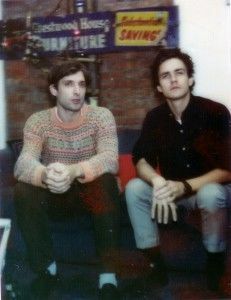 - also missing were some of the recordings Dean made with Jimmy Chambers and Hamish Kilgour after getting a demo deal with Elektra shortly after Galaxie 500 split. A few of these recordings made their way onto a single (and subsequently onto the Speed Dating compilation that No.6 Records released a year or two back). Terry [Tolkin] got me $3000 to record demos for Elektra. I booked time at Wharton Tiers's Fun City studio on East Twenty-second Street. Jimmy Chambers of Mercury Rev came into town to play the drums on most of the tracks, with Hamish Kilgour of the Clean doing a few of them, too. I played guitars and bass and keyboards myself. Seven songs in total, which I delivered to Terry at Elektra, Peter Shershin at Columbia, and Geoff Travis. Terry and Howard [Thompson] liked my demos. The three of us went to lunch at Victor's Cafe on West Fifty-second Street. "What do you want to do, Dean?" "I want to make records." "When I asked Adam Ant that question, he said, 'I want to be a household name.'"